If the amplifier class B need two transistors to work properly, then there are the so-called class C amplifier that only need 1 transistor. There are few applications that really only requires a positive phase only. An example is the pilot frequency detector and amplifier, RF tuner amplifier circuit and so forth. Class C transistor amplifier active work only on the positive phase only, even if the need is quite narrow only the peaks are strengthened. 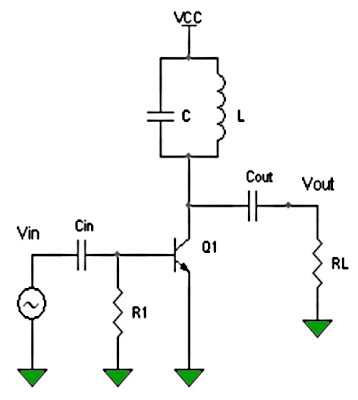 Time signal can replica by series resonance of L and C. Typical of the series class C amplifier is like in the following series. The circuit is also not necessary created bias, because the transistor was deliberately made ​​to work the saturation region. Series L C in the circuit will resonate and contributed important in re-replicate input signal into an output signal with the same frequency. This series if given the bait behind can be a series of RF oscillator is often used the transmitter. Class C amplifier have high efficiency even up to 100%, but fidelitas level is more low. But the actual High fidelitas not be purpose of this type of amplifier.